The Brick Township Department of Public Works is located at 836 Ridge Road, Brick, NJ 08724. Public Works is responsible for collection of household waste, recycling and brush, snow removal, street maintenance, grounds maintenance, fleet maintenance, signs, pothole repair, storm drain maintenance and more. Public Works office hours are Monday through Friday, 8am-4pm. Public Works can be reached by phone at 732-451-4060 or by fax at 732-458-0757. The Brick Township Recycling Center is available for citizens Monday through Saturday, 8am – 3:30pm. It is located at 836 Ridge Road. The facility is available for citizens to dispose of bulk items, metals and recyclables. Citizens must present proof of residence in the form of a tax bill and drivers license to have access to the facility. No construction materials of any kind will be accepted at the Recycling Center. Citizens may also dispose of brush and vegetative materials at the Recycling Center. The center also distributes mulch at no cost; citizens must load their own vehicles and have a cover for the materials. 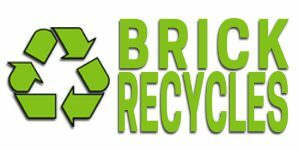 PLEASE NOTE: Use of the Brick Township Recycling Center is limited to residents; no contractors, landscapers, tree services, etc. Landscapers and tree services can bring their materials to the Ocean County facility on New Hampshire Avenue. Garbage collection starts at 6:30am, Monday – Friday. Automated garbage cans should be placed at the curb no earlier than 24 hours before scheduled pick up, placed no later than 6am of your collection day and removed from the curb by 8am the day following your collection. Automated cans should not be placed within 6 feet of other objects including cars. Please do not put leaves, recyclable materials, brush, branches, construction material, hot embers or household materials in your automated cans. Public Works offers on-demand collection of brush, metal and bulk items. 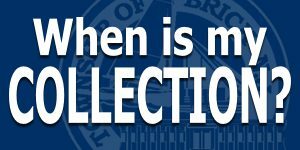 You must call 732-451-4060 to schedule a collection. Tree trimmings, hedge clippings and similar materials must be cut to a length not to exceed 4 feet and must be tied in bundles no greater than 2 feet thick for collection. Additional garbage and recycling cans are occasionally available for purchase. The cost of an automated garbage can is $60 and the cost for recycling cans are $60 (95 gallon), $50 (65 gallon) and $45 (35 gallon) and must be paid in person in the Township Tax Collector’s Office. The can will be delivered to your home. Please call 732-451-4060 to inquire about the availability of automated garbage cans. 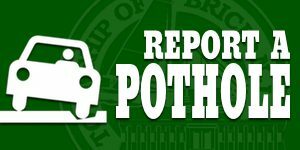 To report a pot hole or other street maintenance issue, please call 732-262-4602. Please note that this is only for streets maintained by the Township which are primarily located in residential neighborhoods. The Township of Brick does not collect hazardous materials or tires. For information regarding disposal of hazardous materials or tires please contact the Ocean County Department of Solid Waste Management at 732-506-5047 or visit their website. Please note that the County charges a fee to accept tires. The Township of Brick no longer offers curbside collection of E-Waste or accepts E-Waste at the Township Recycling Center. E-Waste is made up of electronic devices such as televisions, radios, computers, mobile phones and other electronic devices. The elimination of E-Waste collection was necessitated by the rising costs to dispose of electronic items. At one time, the Township generated revenue through E-Waste collection. Over recent years, the service began costing the township money. Residents may still dispose of E-Waste at the Ocean County Recycling Center, 691 New Hampshire Avenue in Lakewood Township.